In part 1 I went through the basics of setting up the canvas and adding a simple sprite to it. Then part 2 got through handling keyboard controls and animating the hero character. 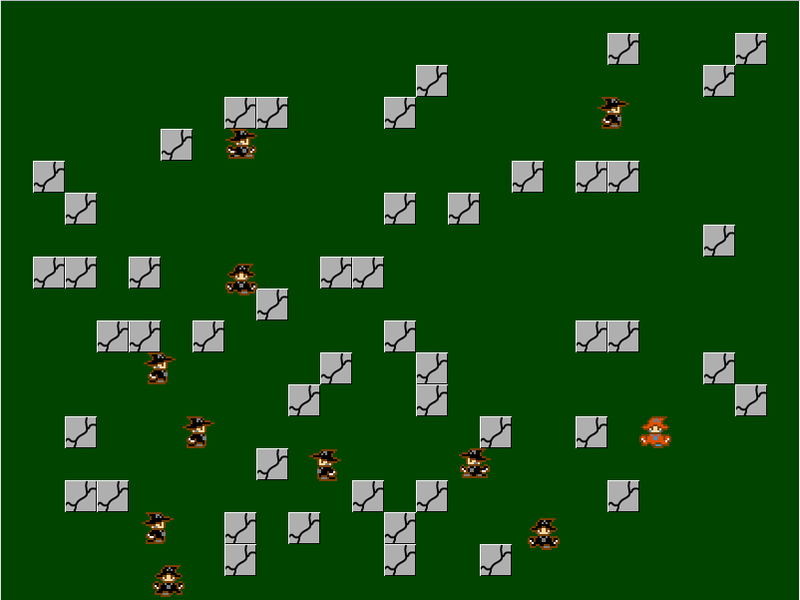 Most recently, part 3 added some scenery objects and the basics of collision detection. We now are to a point where we can leverage the framework we’ve created to add in some bad guys to roam around the canvas. We’ll make some modifications to our heroObject in order to allow it to accommodate NPC characters as well as the player controlled hero. Because I’m all for clichés I’ll be using the same sprite we used for the hero character…only making it evil. We’ll start off with similar functionality that we used for our rock objects in part 3 and add a variable at the top for the number of bad guys we want to have on the screen at one time, an array to hold them all and a base image object to hold the sprite image. The next part is to create an initEnemies function that will combine elements of the initRocks and the initHero functions. For each enemy we want to create we have to make sure it doesn’t collide with the hero and also that it doesn’t collide with any of the rocks that are on the scene. At this point you should be able to run the game and have all the randomly placed rocks from before in addition to the new enemy mages wandering around on the screen bouncing off the rocks and pseudo-randomly changing directions. The next part of the series will get into allowing the hero to throw fireballs to kill the enemy mages and adding in some point tracking for the game. Here’s the link to the demo for this code.